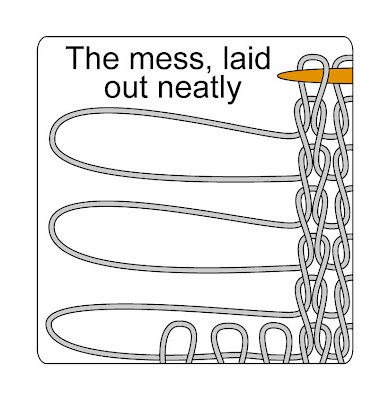 A mess like this occurs when stitches come loose at the edge and run out. Perhaps a stitch slipped off the needle, perhaps you dropped a stitch near the edge to correct an error and things got out of control. Whichever way it happened, the mess looks scary. 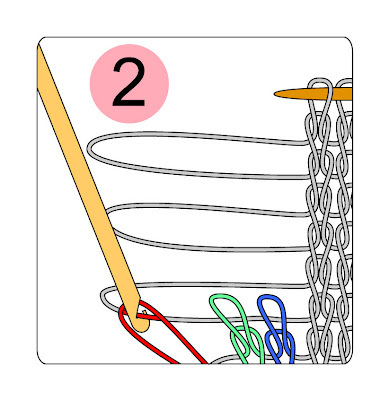 A run at the side edge of your knitting creates loops --giant loops--that look nothing like the ladder of an ordinary run. Most knitters (including, for many years, me) would rather rip back a mess like this than try to fix this on the needles. However, from now on, the situation is altered. No longer do you need to rip back: you can go your way rejoicing. In the same way as you can use a crochet hook to efficiently correct an ordinary run, so you can use a crochet hook to correct a run which occurs at the edge...if you keep your wits about you. Below are two different ways to fix this problem, depending on how you created the very edge stitch--the selvedge stitch--when you first created the fabric. Many knitters (myself among them) always run a chain selvedge in the fabric--created by slipping the first (or last) stitch on every row. (For complete instructions on how to create a chain selvedge, click here.) One reason to run a chain selvedge is that it makes correcting errors in the side edges easier. 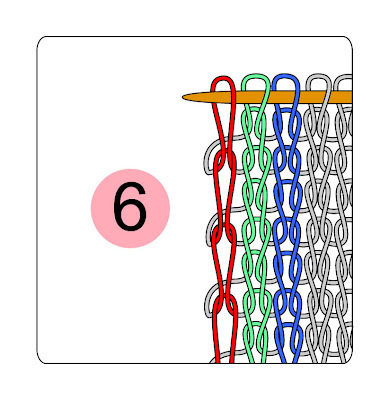 The first set of illustrations below (numbered with pink circles) show how to correct a run when the fabric was originally knitted with such a chain selvedge. However, not every knitter runs a chain selvedge in their work. 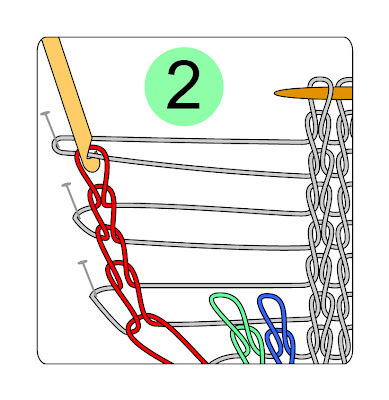 If you are a knitter who knits every stitch on every row, it will be slightly more complicated to fix runs at the side edges--it requires you pin the the fabric to a board in order to fix it. However, although more complicated, it is by no means impossible, and the second set of illustrations (numbered with green circles) shows how. 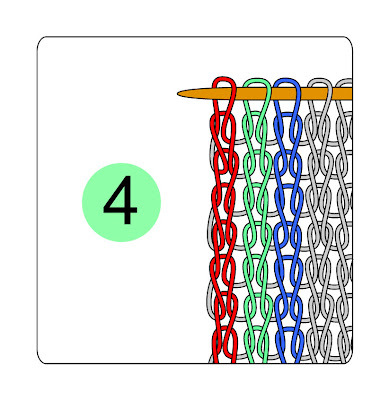 1 (below) In this illustration, three edge stitches have run down 6 rows. 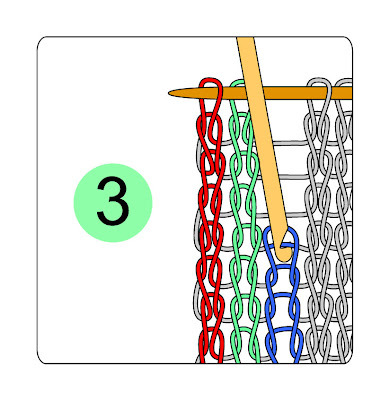 The 3 edge stitches of the last row NOT to run out are called the "foundation row" and are labeled by color. The very edge stitch is red, the two interior stitches are green and blue. Due to the chain selvedge, the red stitches will be hooked up in a 1-for-2 pattern--1 edge stitch for every 2 rows. Because 6 rows raveled out, there will be a total of 3 edge stitches to be recreated. The two interior stitches, the green and the blue, will be hooked up in an ordinary 1-for-1 pattern--1 stitch per row. Because 6 rows ran out, 6 total stitches in each column need to be recreated. 2. (below) Begin by hooking up the red edge stitch as shown. Remember that for a chain selvedge, the outer edge of each loop need only be drawn through once. 3. 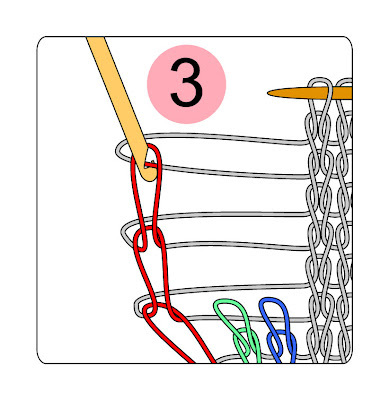 (below) Continue hooking up the red stitches along the outside edge of the loops. As you can see, this process begins to turn the loops into something more closely resembling ordinary ladders in the area above the green and blue stitches. 4. (below) Once the red stitches have all been hooked up and deposited on the needle, begin with the green stitches. Unlike the red stitches, which are chain selvedge stitches--hooked up 1 stitch per 2 rows--the green stitches are ordinary stitches, and are hooked up one stitch per row, as shown. 5. 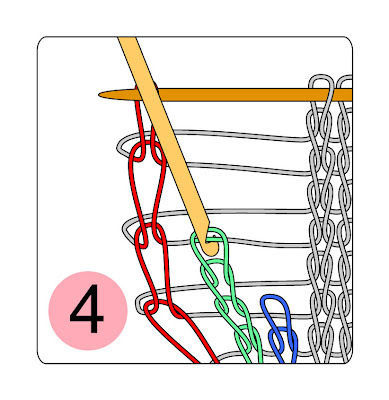 (below) Once the green stitches have been hooked up and deposited on the right knitting needle, hook up the blue stitches in the same manner, as shown. 6. (below) The finished product. Of course, it will not look all neat like this--it will be wonky because the tension has been much disturbed. 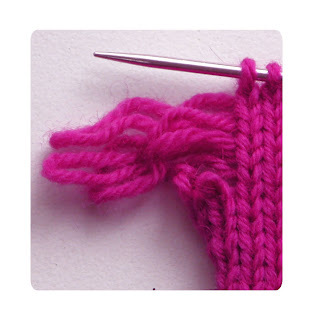 However, some careful picking at the stitch arms with your knitting needle will adjust the tension better. Wearing and blocking will smooth things out further until, over time, you won't be able to tell there was ever a problem. 1. (below) When you are running an ordinary selvedge, the work of correcting an error at the edge is a little more complex. The trouble arises because the outer edge of each loop must be turned into two stitches--one above the other, to match the fact that every stitch of every row was knitted. Stated otherwise, because the edge stitch was not slipped, you must have the same number of stitches along the edge of the work as in the interior columns. This takes a little hocus-pocus to create, but, with the help of pins and a board, a run on this sort of edge can also be corrected. 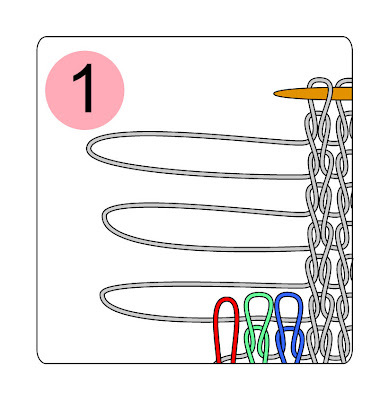 Begin by pinning out the loops, as shown. 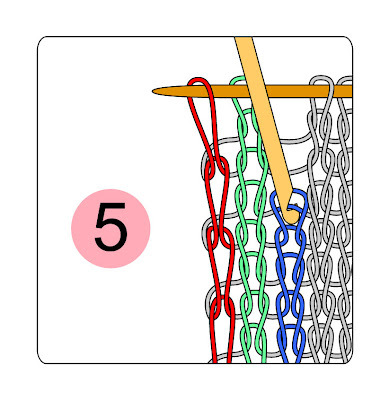 Next, draw the "bottom" part of the outermost portion of the loop into the foundation stitch (red) with a crochet hook as shown. 2. (below) Once you have drawn up the part of the loop below the pin, you next draw up the outermost part of the loop above the pin. In other words, the red stitches are hooked up once below the pin and then again another time above the pin. This creates 2 stitches at the outer edge of every red loop. 4. (below) The finished work. As stated above, the tension will be wonky when the error is first fixed. However, judicious tension readjustment of the stitch arms with a knitting needle, coupled with blocking and wear, will all act together to smooth out the area until no trace of the correction shows. One last thing: The run-out loops in these illustrations are not to scale. 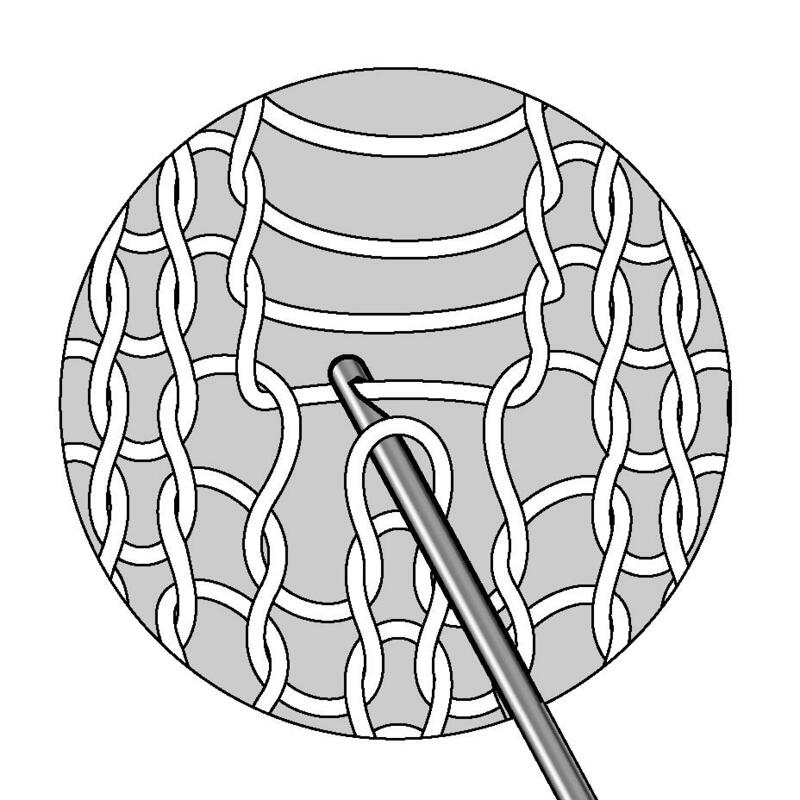 A loop resulting from 5 or 6 raveled out stitches is relatively longer than the illustrations. Paradoxically, once you start hooking up, the ladders are relatively shorter than they appear in these illustrations. If you need to use a very small hook indeed for the interior (green and blue) stitches, no fears--you're not doing it wrong.